Who Would You Build Your Team Around: Karl Anthony Towns or Joel Embiid? Every franchise should begin with a cornerstone. In the history of the NBA, many franchise cornerstones were big men. We saw the likes of George Mikan, Wilt Chamberlain, Bill Russell, Kareem Abdul Jabbar, Moses Malone, Shaquille O’Neal and Tim Duncan among others, lead their respective teams to NBA titles. In the current NBA set-up, there are plenty of big men who are worthy of franchise player billings. Among the current big men in the NBA, the Minnesota Timberwolves’ Karl Anthony Towns and the Philadelphia 76ers Joel Embiid stand out as two of the most promising talents around the league. It’s obvious who got the last laugh here. The picture quality wasn’t really trash. But it was pretty poor…..perhaps as poor as Towns’ defense on Embiid, which probably cost the Wolves Tuesday’s game. Embiid later explained that ‘raising the cat’ wasn’t a direct swipe at Towns, whose nickname is ‘KAT’. 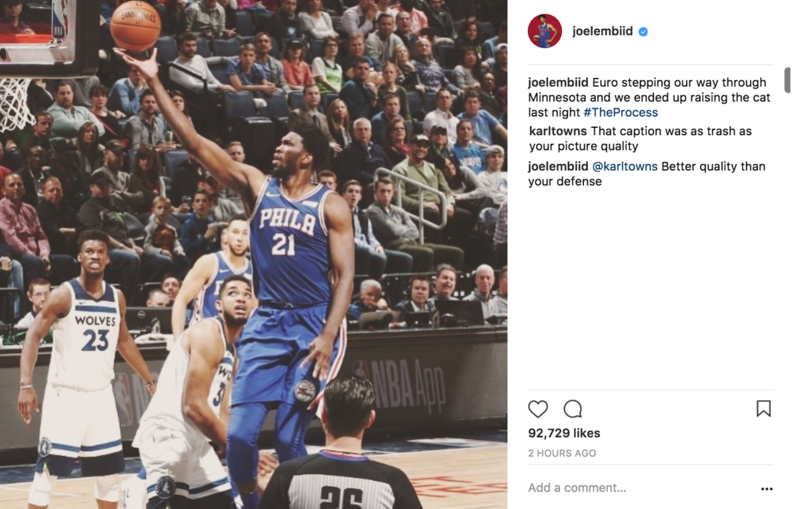 Embiid added that ‘raising the cat’ was started by a Philly fan and which later became some sort of ‘tradition’ each time the Sixers would win games….like Tuesday night against the Timberwolves. Embiid outscored Towns 29-18 in that game while KAT outrebounded the Process 16-12. Embiid had the edge in assists at 8-2 while Towns had the edge in blocks at 3-1 and steals 4-0. It was the third head to head meeting between these two superstar centers and Embiid has won two of them. With Towns only 22 and Embiid just 23 years of age, expect these two to have plenty of head to meetings between them in the years to come. Embiid and Towns are friends off the court but inside it, they play and talk like rivals. Between the two though, who would you pick if you were given the chance to select the player you want to build your team around? For the second consecutive year, Towns was picked by the NBA’s GMs as the first player to sign if they were to start a new franchise ( 29% ). The Wolves’ big man was also the GMs 2017 choice as the Best Center in the NBA ( 28% ) and their pick to have a breakout season in 2017-18. Embiid didn’t get a single GM to vote for him in any of the categories mentioned above. That’s probably because of health issues more than Embiid’s basketball abilities. Embiid missed his first two NBA seasons with a series of foot problems. Then after he was cleared to play last season,Embiid played just 21 games last season before he was shut down with a meniscus tear. When he was healthy though, he was impressive. Embiid scored 20 points in 19 of the 21 games he played. He averaged 20.2 points, 7.8 rebounds, 2.1 assists, 2.5 blocks per game and shot .367 from beyond the arc. That despite the fact that he never played more than 30 minutes. More importantly, the Sixers were 15-16 with him playing and just 13-38 without him. Towns meanwhile, has never missed a single NBA game in three seasons. KAT averaged 25.1 points, 12.3 rebounds, 2.7 assists, 1.3 blocks per game and shot .363 from the three point area last season. He led the Wolves to 31-51 record last season and 29-53 in his first season when he won Rookie of the Year honors. This season, Embiid is doing better than Towns, statistically. The Process is averaging 23.7 points, 11.1 rebounds, 3.4 assists and 1.9 blocks per game. Towns is doing 20.4 points 11.8 rebounds, 1.8 assists and 1.4 blocks per game. KAT has played seven more games than Embiid this season, mainly because of the restrictions and precautionary measures the Sixers have taken in order to preserve his health. What makes Karl Anthony Towns special is that he is a big man with an outside shot. This season, Towns made 37-102 three pointers ( .363 ) while Embiid has only made 16-58 ( .276 ) threes so far. Last season however, Embiid made .367 of his three pointers so let’s not count out the Process yet in this statistical category. In terms of true shooting percentage, Towns has the slight edge over Embiid too as the former University of Kentucky standout is a career .608 while Embiid is at .581 in two seasons played. Towns is also the better free throw shooter at .825 for his career. Embiid meanwhile is also a very decent foul shooter for a big man at .790 so far. On offense, it’s in the assists category where Embiid beats Towns. The former Kansas Jayhawk is averaging 3.4 assists per game while Towns is only dishing off a career low 1.8 dimes per contest. For his career though, KAT is at 2.2 assists per game as compared to Embiid’s 2.7 helpers per game. Embiid’s defensive rating is far superior than Towns’. The Process is giving up just 102 points per 100 possessions while KAT is allowing 107 points per 100 possessions. Embiid is also the better shot blocker at 1.9 blocks per game this season as compared to Towns’ 1.3 blocks per contest. Towns has the better rebounding numbers but the only reason why that is so is because Embiid doesn’t play as much minutes. If you take a look at their per 36 minutes stats, Embiid’s 2017-18 rebounding average and career rebounding average are slightly better than Towns’. In steals, both average 0.8 per game this season although Embiid’s career average of 1.0 steal per game is just a little better than Towns’ 0.7 steals per game average. Both players have almost identical defensive win shares for 2017-18. Embiid currently has 1.1 while Towns has 1.2. Health issues aside, Picking between these two is like apples and oranges. Both are offensively gifted although it’s safe to say that Towns has the better range between the two of them. However, Embiid has shown that he is the better passer at this stage of this careers and that’s where he makes up for his shooting deficiencies. Defensively, Towns has proven to be the better rebounder and Embiid the better shot blocker. The difference isn’t too big however so you can’t really say that one is superior than the other on the defensive end. However, if we factor Embiid’s playing time, he has better production. But then that’s the point in this comparison. Embiid hasn’t shown that he can play a full season. He’s played more minutes this year than during his rookie season but still, it’s not the kind of minutes you want your go to guy to play. The Sixers are winning though and that’s what matters, so you can’t dwell on that argument too much. Still, Embiid’s missed games due to rest and the Sixers are 1-4 in those games this season.